We're continuing our crawl along Church Street with a visit to Ellery and Co. There's been a recent change behind the scenes with Brent Baigent former chef/part-owner of Centonove taking charge. Unlike our recent experience at nearby Coffee Hit, the coffee here has been excellent - served at the correct temperature. In fact our first visit here was just for coffee and it so impressed us we decided to try our luck with breakfast. 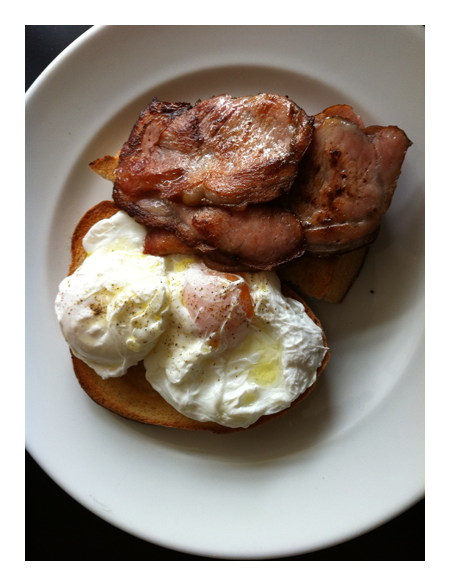 Poached eggs and bacon on toast. Interestingly they ask if you'd like your toast buttered - I think that is a nice touch. The eggs were spot on, lovely and runny. The toast was good - two slices while the bacon tasted like it had come off the heat. 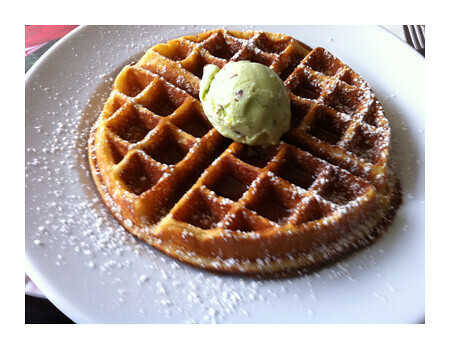 The star item has got to be the waffle pancakes with pistachio ice cream and maple syrup. These are so incredibly light and fluffy I fear Paalo might finally abandon his love of ricotta pancakes for these waffles.